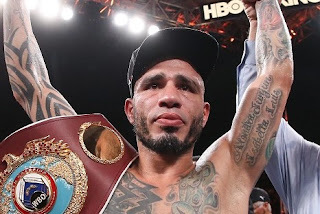 As Miguel Cotto prepares for his farewell fight on Saturday night against Sadam Ali, the boxing world has turned this week into one of tribute, full of hosannas, hagiography and extolment directed at one of the most successful fighters from Puerto Rico. HBO, which is airing Saturday's bout, took the unusual step of presenting a career retrospective. Many writers and fans have expressed their deeply felt sentiments regarding Cotto. Certainly, he has made quite an impact in the boxing ring. December 2, 2006, Miguel Cotto headlines at Boardwalk Hall in Atlantic City. Although he's facing a fellow Puerto Rican in Carlos Quintana, Cotto is the star of the night. The fans are there for him. Cotto, attempting to win his second world title belt, has already become a huge attraction. Quintana, a tricky spoiler, just upset undefeated prospect Joel Julio. Fighting for the first time at welterweight, Cotto looks huge in the ring. Quintana lands a few crafty shots in the first two rounds as Cotto gradually closes the distance. By the fifth round, Cotto stalks Quintana menacingly, peppering his foe with vicious power shots. With a little under a minute left, Cotto unleashes a ferocious left hook to the body that sends Quintana to the canvas. Quintana beats the count but Cotto's follow up assault forces him back down. Quintana survives the round but can't endure any longer. He retires on his stool. Cotto beat the fight completely out of him. That was my first live boxing card, a double bill that also featured Antonio Margarito (Cotto's future nemesis) against Joshua Clottey. Given floor seats as a birthday present, I watched the fights with awe. After witnessing Cotto's act of destruction in front of his raucous, rapt fans, I was completely hooked on the sport. If I had become an increasingly passionate fan prior to that night, afterward, there would be no denying that boxing had me in its clutches. As my love of boxing continued to deepen, for whatever reason my allegiance to Cotto did not. I had no animosity toward him at that point in his career; he just didn't resonate with me as much as others did. Boxing's a strange sport. Fans develop affection for specific fighters. Sometimes these allegiances fall along geographic or ethnic lines. Other times, the root cause of such affinity can be harder to pinpoint. I found myself falling for unlovable fighters like Bernard Hopkins, crude bangers, such as Carl Froch and even hated runners like Miguel Vazquez. Keith Thurman and Marco Huck struck my fancy – I’m not always sure why. Cotto was never one of "my guys," but that's certainly OK. He played that role for millions of boxing fans, in his native island and for others around the world. Prior to his first fight with Margarito, Cotto was a come-forward attacker who made for great television. His left hook was one of the more menacing punches in the sport. What he lacked in foot speed he made up for with his ability to cut off the ring and a high ring IQ. If his opponents weren't fully up to snuff at 140, within a short time at welterweight, he was facing the likes of Zab Judah and Shane Mosley. Top Rank had sent him out to the deep water. During Cotto's rise in the sport, an interesting dichotomy emerged between his explosiveness in the ring and his pensive demeanor everywhere else. Unlike many a modern athlete, Cotto didn't partake in grandiloquence or outlandishness. He was taciturn around the media. He projected humility. He was much more of a blue-collar type of fighter and he was content to let his actions in the ring be his best spokesperson. As Cotto reached the top levels of boxing, he experienced defeat and uncertainty. The relationship with Evangelista Cotto, his uncle and trainer, devolved into conflict and acrimony. He went through a number of coaches; sometimes he seemingly trained himself. Meanwhile, the losses started to come more frequently. He had four defeats in just over four years – to Margarito, Pacquiao, Mayweather and Trout. He had left Top Rank, which had done a fine job in building his career and turning him into a star. No longer under the watchful eyes of matchmakers Brad Goodman and Bruce Trampler, Cotto took an ill-advised bout with Austin Trout and looked like an ordinary fighter. It's one thing getting beaten to a pulp by a prime Manny Pacquiao; it's another proposition when dominated by a tricky, rangy southpaw like Trout, who had little cache in the sport and no fan base to speak of. In the back part of Cotto's career, he asserted his starpower and overall status in the sport to his advantage. Having given in to weight demands from Pacquiao that he felt negatively impacted his performance in that fight, Cotto insisted on a catchweight against middleweight champ Sergio Martinez. He briefly reunited with Top Rank before leaving for RocNation, where he was promised huge purses and opportunities for a potential music career. Both fights this year have been against lesser foes, but Cotto now views himself as an institution; networks should be lucky to have him. From his perspective, his fight against Sadam Ali is his De la Hoya-Forbes or Mayweather-Berto. He's allowed to have lesser fights because in his mind he's earned it. Cotto will leave the sport more as a businessman than a top fighter, but this transition was often forced upon him by outside influences. When the chips were down in his career, he found that he could only rely on himself for protection. The nastiness of the boxing industry changed Cotto. Although he was a star for Top Rank, he was never their number-one guy. He had to get down to 144 to face Pacquiao, Top Rank's cash cow, even though he hadn't weighed that little in years. When it came time to negotiate that fight, he quickly realized where the bread was buttered. After Antonio Margarito was suspended for having a hardened-like substance in his wraps prior to fighting Shane Mosely, Cotto didn't respond well to Top Rank's support for Margarito. To him, his first loss may very well have been attributed to illegal practices by Team Margarito. Why was Top Rank going to battle for a cheater? In later years, Cotto learned how he wasn't afforded the same guidance under Golden Boy that he had received earlier in his career. However, despite the turbulence of the boxing business, he triumphed on many occasions. He avenged an amateur loss to Muhammad Abdullaev in a spirited contest. Beating back a stiff challenge from Zab Judah, Cotto's malice and vicious body punches led to a victory over a superior athlete. He found a way to outbox Shane Mosley in the championship rounds to prevail in a fantastic fight. Eventually, he got revenge on Margarito. He ended Sergio Martinez's career to become the lineal middleweight champ. As Cotto leaves the sport, he'll have made his mark by winning titles in four weight classes, amassing legions of fans and earning millions. He'll be remembered as one of the true stars of boxing during first 20 years of the 21st century. In my final analysis, he was a very good fighter – just short of great. Against anyone a step down from the elites, he could be punishing and dominant. As his career continued through its various high points and setbacks, the humble kid grew up to become a much different adult. He could be sullen, prickly, distant, easily offended and hard to negotiate with. Nevertheless, his fans stuck with him until the very end. Cotto had enough of a following to receive not one, but two gimme fights from HBO to conclude his career. If he wasn't always my cup of tea, I recognize that I hold a minority viewpoint, and I'll always be grateful to him for that night in Atlantic City. He was a memorable fighter and if he landed his left hook just right, "no mas" would follow in short order.